The lovely people at ithlete have supported the TORQ Track Cycling Team by providing them with ithlete HRV measurement, with the deeper analysis and understanding that comes with an ithlete Pro account, and so we thought we would tell you more about this amazing tool and how it works for us. Track Team Manager, Jan Birkmyre, pushed for the team to use ithlete so that they could optimise their training because, having used it for six years now, she knows just how powerful it can be. Mel and Louise have been taking daily HRV reading with ithlete for a year now, so it seemed like a good time to reflect on how it has helped each member of the team to be the best that they can be. 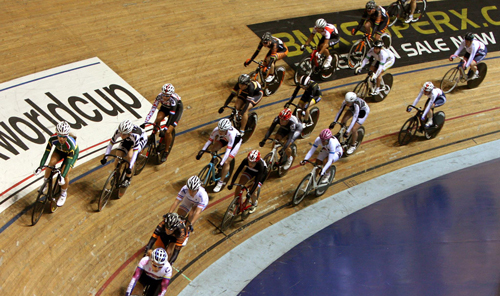 For the TORQ Track Team, 2015 has been a spectacular one with members riding numerous personal bests, setting new World Masters records, winning the National Omnium series and claiming World and National Masters titles. ithlete allows you to quickly and accurately measure your heart rate variability (HRV), which gives an insight into general health and how the body is dealing with stress and fatigue. HRV is simply a measurement of the time gaps between your heart beats; these vary as you breathe in and out, and the greater the variability, and therefore the higher the HRV number, the better. In fact HRV is such a critical measure of health, that it is used to predict the 24 hour survival rate of heart attack patients (the original research is here). By taking a one minute reading each morning with ithlete, you get a daily HRV number, which effectively tells you how well recovered you are from training and the other stresses that life throws at you. Once a base line has been established, you can rely on ithlete to help you decide whether to train hard, or enjoy some well-earned rest and recovery, knowing you have earned it and safe in the knowledge that you are doing what is right for your body. It is effectively the ultimate personalisation of a training plan, taking into account the effect of not just your training load, but also work stress, quality of sleep, nutrition and all the other pressures of life that take their toll on our energy levels and the ability to recover. In addition to a detailed Timeline, where you can compare trends in your HRV to subjective measures (training load, sleep, fatigue, muscle soreness, mood and diet), ithlete Pro offers a Training Guide. This is a whole new way of looking at energy and recovery. On screen, it is a bubble chart that sits just below the daily readings and plots recovery against activation. Recovery is your HRV relative to your baseline over a 30 day period, whilst activation uses average R-R intervals (essentially your resting heart rate), captured during the HRV measurement, and it is a calculation over the same 30 day period*. Research has shown that these measures are important in flagging non-functional overreaching and overtraining, so based on these readings, ithlete plots a daily bubble for you which will fall into one of four zones that prescribes the type of training your body is ready for: Normal, Light, Rest or High Intensity. Don’t think that ithlete is an “easy out” though, as all three of us on the Track Team have actually trained harder and longer using this system, in preference to the more common practice of taking adaptation weeks at regular intervals. And the results have been quite amazing, with everyone on the team managing to stay more healthy (happily avoiding the bugs that seem to go around), riding personal bests in the big competitions this season and taking some notable wins, too. *Here’s the science bit for those who want to understand a bit more. The key to the Training Guide is that the average R-R interval (your heart rate) is controlled by both the sympathetic and the parasympathetic nervous systems, whilst the HRV measurement (the time gaps between your heart beats) correlates well with just the parasympathetic, so taken together these measures give an insight to both nervous system branches. The ithlete Training Guide monitors how these two nervous systems are working, and gives you daily advice based on whether your Energy and Recovery are in the Normal Range, or whether one or the other is impaired. If the latter is the case, the ithlete suggests that training intensities should be reduced or rest taken to allow the system to deal with whatever stresses (work, life or training) the body is currently struggling with. And finally, just in case you have forgotten the human biology you were taught at school, the sympathetic nervous system prepares the body for action; it mobilises the fight or flight responses such as increasing the heart rate, increasing the release of sugar from the liver into the blood – under sympathetic control the body tenses and becomes more alert. The parasympathetic nervous system controls the body while it is at rest; it restores the body to a state of calm and is known as the rest-and-digest response, including decreased heart rate, muscle relaxation and increases digestive processes. You might assume that when one is dominant the other is dormant and indeed, in a healthy unstressed body that is the case. However, studies have shown that they do not always work in opposition and, when this happens, it indicates the individual is moving towards Non-functional Overreaching or Over training. As a result of using ithlete Pro, the team now has a much better understanding of what stressors affect their recovery and, armed with this knowledge, we have all managed to better balance the work:life:training mix and have been healthier as a result. This has meant we have trained harder and more consistently, without catching the bugs that seem to go around. For the team, the race results speak for themselves, but you don’t need to be an elite athlete to benefit from tracking your HRV. 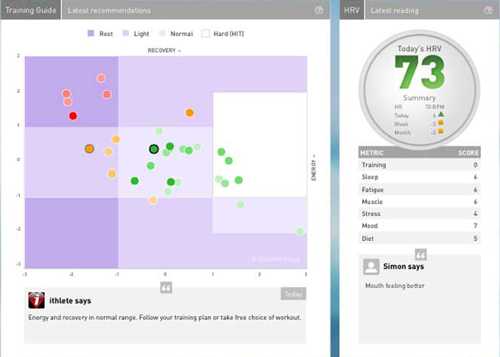 For anyone who wants to optimise their health, daily HRV measurement is a great place to start, and ithlete is a super-simple and highly accurate way to do that.